An exceptionally precious blend of 12 highly potent and balancing oils, botanicals and minerals, carefully selected for their cell regenerating, deep moisturising and tissue repairing properties. In a base of Demeter certified biodynamic Australian Olive oil, sun-infused for 4 months with hand-picked, cool temperature air-dried Tasmanian Calendula flowers and sun-cured Vanilla bean, grown on hand-pollinated Orchids in the Australian Daintree forrest. Hand blended and small batch composed. We pour our precious oil into black-looking exceptionally high quality violet glass bottles made in Switzerland to protect the oil and extent it's shelf life. 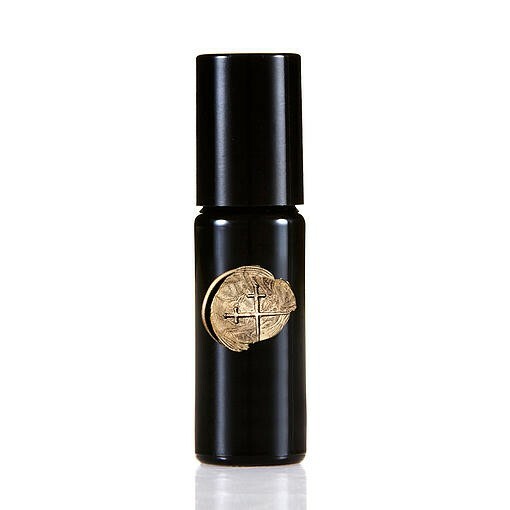 The bottle is presented in a black recycled cardboard board box with hand applied gold wax seal. FREE OF PRESERVATIVES, STABILISERS, FRAGRANCES, CHEMICALS, ANYTHING UNNATURAL. TESTED ON HUMANS (goes without saying, really). Less Tasmanian Calendula Flowers* + Daintree Vanilla*, Sun-Infused In Australian Olive Oil**.Seabuckthorn Seed + Fruit Oil*. Papaya Seed Oil. Pomegranate Seed Oil*. Blueberry Seed Oil. Raspberry Seed Oil*. Myrrh*. Frankincense*. 24 Karat Gold. *Organic. **Biodynamic.